With less than three weeks until 'Canelo' Alvarez and Gennady Golovkin face off on September 16, the undercard was officially announced Monday afternoon. Featherweight contenders Joseph 'JoJo' Diaz and Jorge Lara will square off in a 12 round WBC elimination bout. The fight will take place at the T-Mobile Arena in Las Vegas. The southpaw Diaz (24-0, with 13 KOs), who resides in the Los Angeles suburb of Downey, was originally penciled to face Josh Warrington. In fact, Diaz had hopes of a Warrington clash as the British fighter is ranked number three by the WBC, while Diaz is ranked one spot ahead. To the chagrin of Diaz and those at Golden Boy, Warrington withdrew from consideration of the fight. With Lara being the next highest available contender at number five, the WBC ordered the fight to be an elimination fight. The winner of the fight will receive a mandatory title shot against Gary Russell, Jr., who owns the WBC title. "It's a dream come true to be fighting in the co-main event of the 'Canelo' versus Golovkin card," said Diaz, Jr. "I finally get the opportunity to fight for a title eliminator. I've been waiting my whole life to become a world champion. On September 16, I'm going to give it everything I got." In his last bout on May 6, the 24-year-old Diaz won a 10 round unanimous decision over Manuel 'Tino' Avila, a fight that also took place at the T-Mobile Arena in Las Vegas. Diaz is ranked also ranked number one by the WBO and number four by the IBF. Lara (29-0-2, with 22 KOs) is a 26-year-old southpaw who resides in the boxing hotbed of Guadalajara, Jalisco, Mexico. In his last bout on May 20, Lara stopped Mario Briones in the third round. "I haven't seen too much of Diaz, but I know he's a tough opponent," said Lara, who also owns a knockout victory over former world titleholder Fernando Montiel. "I also know that he participated in the 2012 Olympic Games in London. More than anything else, I know that we have to give a great fight, and I hope that he throws punches and brawls." Another clash of unbeaten fighters will also take place September 16. Randy Caballero and Diego De La Hoya will square off in a 10 round junior featherweight bout. Caballero (24-0, with 14 KOs), who resides in the Southern California desert city of Coachella, won a hard-fought 10 round unanimous decision over Jesus Ruiz on March 23. De La Hoya (19-0, with 9 KOs), who is the younger cousin of promoter Oscar De La Hoya, defeated Alan Isaias Luques by unanimous decision over 10 rounds in Villa Mercedes, Argentina on July 1. Opening the HBO Pay-Per-View telecast (8 p.m. ET/ 5 p.m. PT) will be a 10 round lightweight bout between Ryan Martin and Francisco Rojo (20-2, with 13 KOs). Martin (19-0, with 11 KOs), who is Chattanooga, Tennessee and is promoted by K2 Promotions, won a one-sided decision over Marcos Jimenez in his last bout on June 30. "I realize there are a lot of big fights that can be made right now in the lightweight division," said Martin. "There are a lot of projections and talks for me to be a part of some of those bigger fights. But, right now, I have to get past Rojo." Also taking place in Las Vegas in a non-televised bout will be a 12 round featherweight bout between interim WBA featherweight titleholder Claudio Marrero (22-1, with 16 KOs) and Jesus Rojas (25-1-2, with 18 KOs). With the amount of quality fights on the card, Oscar De La Hoya reiterates September 16 is as solid a fight card this year. 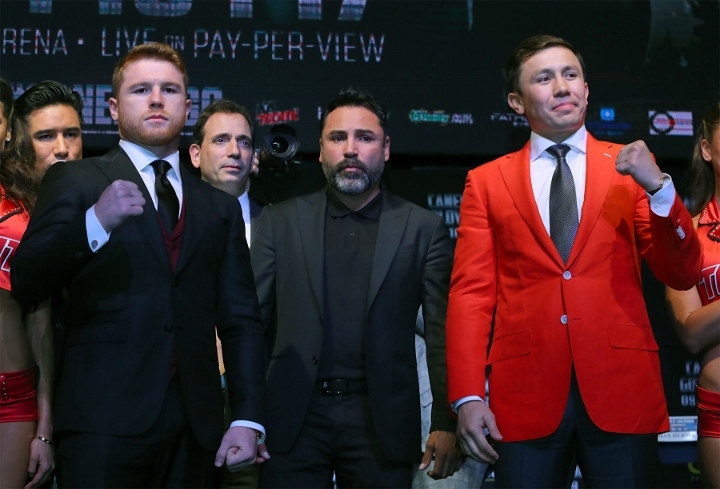 "The 'Canelo' versus Golovkin undercard will feature some of boxing's best contenders and rising stars," said De La Hoya. "The fans will be in for a treat and won't want to miss the action. "From JoJo Diaz to Randy Caballero, Diego De La Hoya, Golden Boy has stacked the undercard with some of the toughest fighters in the sport today that are determined to put on great fights for the fans." Junior welterweight prospect Vergil Ortiz (6-0, with 6 KOs) and Marlen Esparza (2-0) will also fight on the card in separate six round bouts. [QUOTE=Chuckguy;17995190]Says the racist pro black guy[/QUOTE] No normal human being wants to watch 2 punch bags going at each other. Boxing is about skill not blocking shots with your face. [QUOTE=bigdunny1;17996003]You called it, Fat Dan just reported that the Rojas fight is now the main event for the ESPN card on Sept 15. :boxing:[/QUOTE] Smart move. Interested to see who they put in there place.